Edinburgh Festival of Cycling starts today! Rides, films, talks, drama, books, photos, workshops and lots more. Today’s events include the SEStran Commuter Challenge 2015, talks by Swiss mountain biker Gian Liesch and intrepid bike messenger Emily Chappell, and a reading of a new play by Tamara von Werthern. For more information please see the festival’s website here or its Facebook page here, or pick up a programme from many venues across the city and beyond, including libraries, leisure centres and many shops. 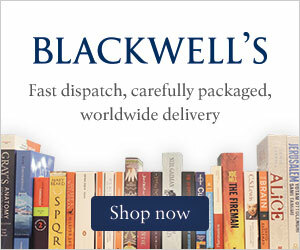 Ends 21st June 2015. 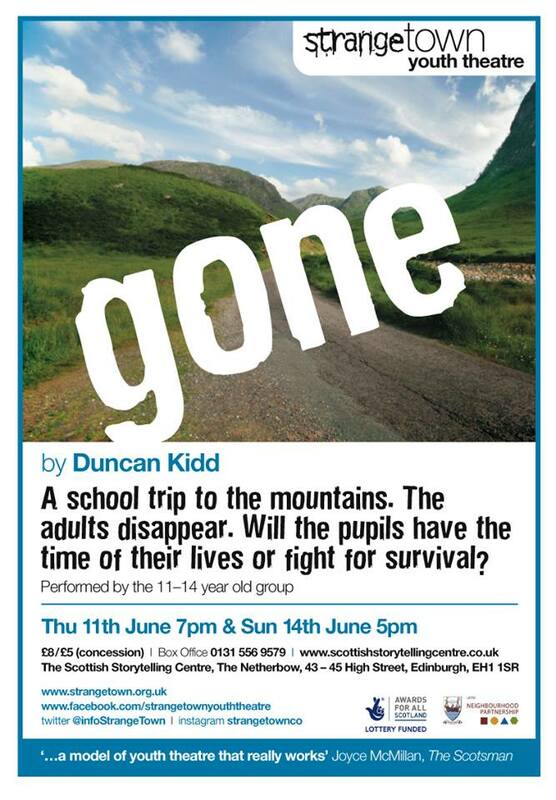 Strange Town Presents Gone by Duncan Kidd: a play about a rather different school trip… Suitable for all ages. 7pm, Netherbow Theatre, Storytelling Court, Scottish Storytelling Centre, 43 High Street. Tickets cost £8/£5 and may be purchased in person, by calling the Box Office on 0131 556 9579 or online here (transaction fee applies to phone and online bookings). Also at 5pm on Sunday 14th June 2015. Strange Town is a theatre company that aims to enable young people aged 5-25 years to fulfil their creative potential whilst producing work of the highest quality that is daring, exciting and entertaining. The company is based at Out of the Blue, Dalmeny Street. The performers in Gone are all aged 11-14 years. Coast to Coast: a group exhibition of new works by gallery artists including Hazel Cashmore, Beth Robertson Fiddes, Ian Rawnsley, Imogen Alabaster, Mark Nicholas Edwards and Susie Christie, featuring works inspired by the sights and sounds of the coast and beaches. 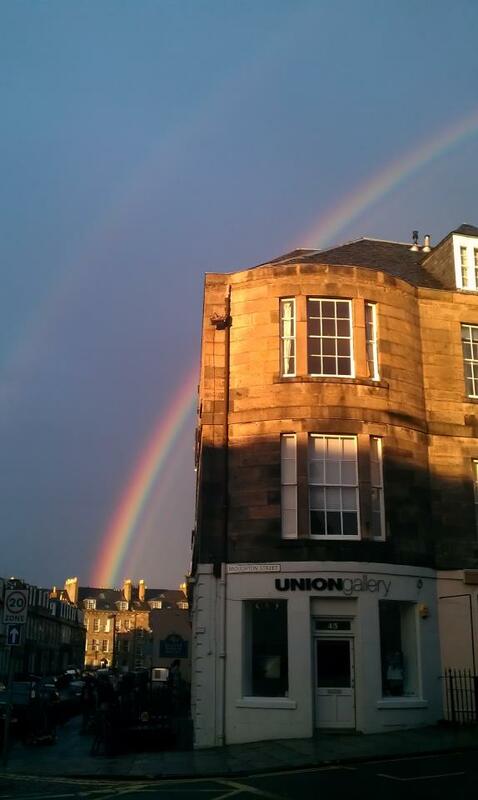 10.30am-6pm Tuesday to Friday, 10.30am-5.30pm Saturday and 12 noon-6pm Sundays, Union Gallery, 45 Broughton Street. Poetry and Coffee: with AC Clarke, Jim Aitken and Rosemary Hector. 10.30-11.30am, Henderson’s Cafe, 94 Hanover Street. Free drop-in event: for more information please contact henry.e.marsh@gmail.com. Live Music Now: Ian Watt. The Scottish guitarist, internationally known through his performances all over the world, plays Baroque music from the royal courts of Europe in anticipation of the Liotard exhibition, together with a selection of Edvard Grieg’s evocative Lyric Pieces. 6-6.30pm, Scottish National Gallery, The Mound. Free and unticketed. 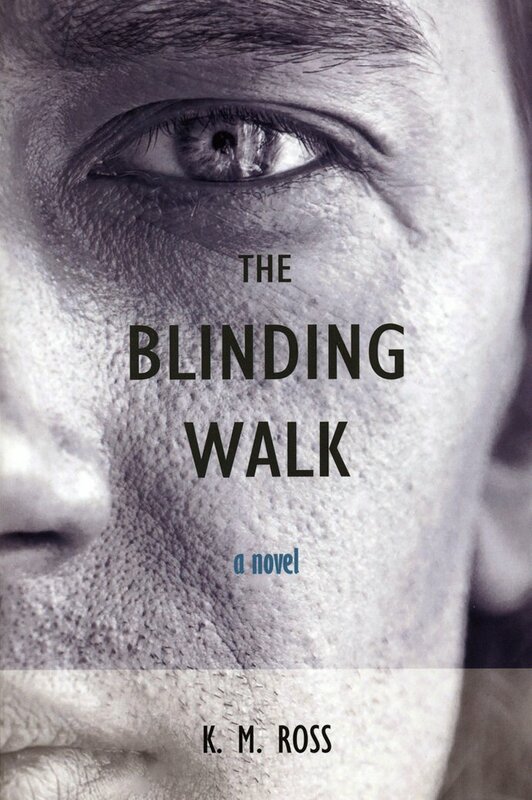 The Edinburgh Bookshop and Waywiser Press Present KM Ross: The Blinding Walk. The New Zealand born, Edinburgh-based, author of Falling Through the Architect presents his new novel: in the aftermath of an unforseen and tragic turn of events, Mel Seuchar strides along Longniddry beach trying to make sense of it all. What really happened? How did it come to this? ‘An epic novel of skilfully crafted and memorable characters deftly interwoven into a complex and engaging story’ (Helen Dumont).7pm, The Edinburgh Bookshop, 219 Bruntsfield Place. Free but booking is advised and may be made by calling the shop on 0131 447 1917. 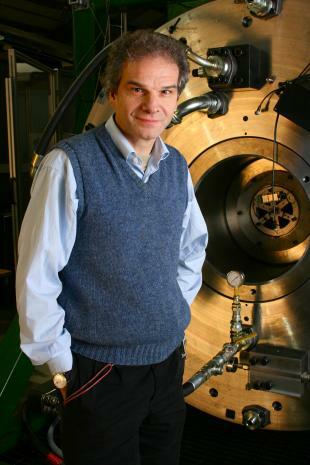 University of Edinburgh Inaugural Lecture: Professor Win Rampen, Chair of Energy Storage, speaks on Energy Storage: Our Future Salvation? 5.30-6.30pm, Swann Lecture Theatre, Michael Swann Building, University of Edinburgh, Max Born Crescent, The King’s Buildings, EH9 3BF. Free and open to all. Please contact louise.farquharson@ed.ac.uk for further information. Portrait Gallery Curator’s Talk: The Scandal of the Feuding Philosophers – Hume and Rousseau in 1766. 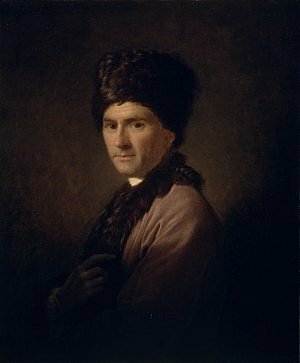 This month Lucinda Lax talks about Ramsay’s celebrated portraits of David Hume and Jean-Jacques Rousseau. 5.30-6pm, Scottish National Portrait Gallery, 1 Queen Street. Free and unticketed. 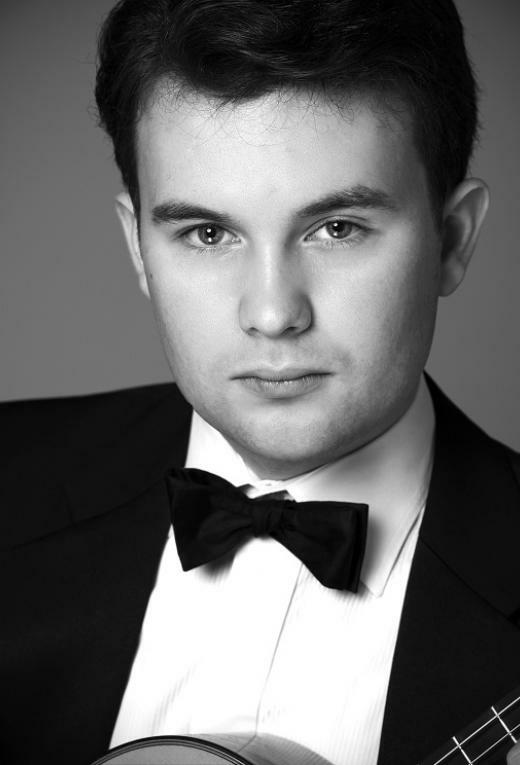 Spark Greyfriars: an organ recital by James Ritzema (Reid School of Music) 12 noon-12.45pm, Greyfriars Kirk, Greyfriars Place. Free. 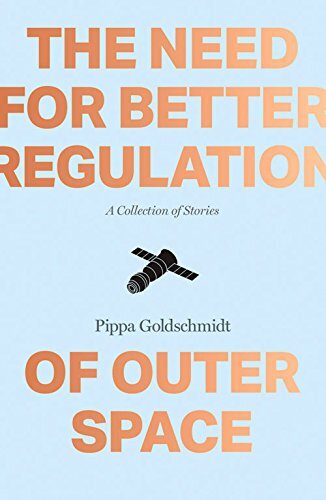 Pippa Goldschmidt: The Need for Better Regulation of Outer Space. The author of the acclaimed novel The Falling Sky brings together an outstanding collection of short stories on the theme of science and its impact on all our lives. ‘In turns witty, accessible, fascinating and deeply moving, Goldschmidt demonstrates her mastery of the short form as well as her ability to draw out scientific themes with humane and compelling insight’. 6.30pm, Looking Glass Books, Simpson Loan, Quartermile. To reserve your free place please email info@freightbooks.co.uk. 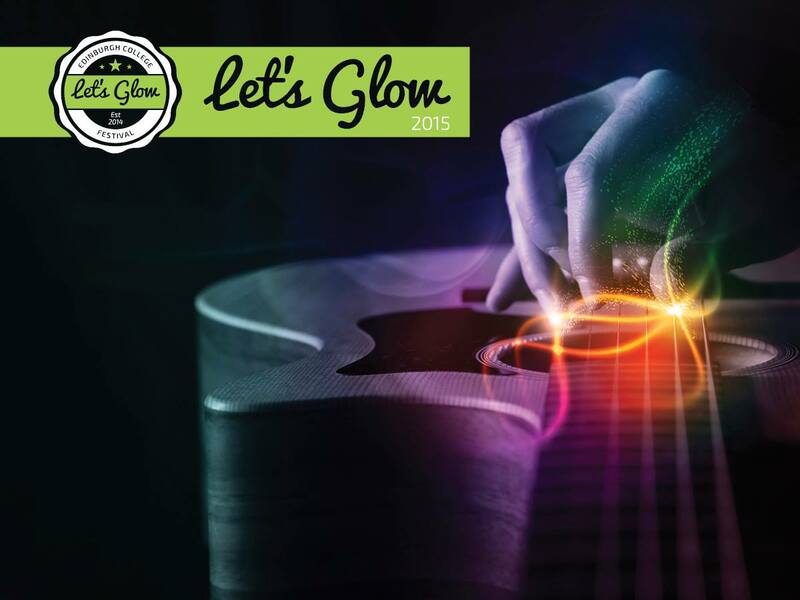 Let’s Glow: Edinburgh College Summer Showcase. The College’s Music Box presents a showcase of classical, jazz and traditional music, the culmination of a year’s work by the College’s students. Join them to celebrate their achievements in an evening featuring ensembles that include the choir, big band, concert band, brass group and folk group. 7.30pm, Queen’s Hall, Clerk Street. Tickets cost £10/£8 and may be purchased from the Queen’s Hall Box Office in person, by calling 0131 668 2019 or online here. Cafe Voices: Fathermen. To complement the Scottish Storytelling Centre’s current Fathermen exhibition, storyteller Peter Snow explores the presence – and the absence – of men in family settings. This is the Centre’s monthly storytelling session, with an open-floor section for storytellers to tell their own tales. 7pm, Storytelling Court, Scottish Storytelling Centre, 43 High Street. Tickets cost £5 and may be purchased in person, by calling the Box Office on 0131 556 9579 or online here (transaction fee applies to phone and online bookings). 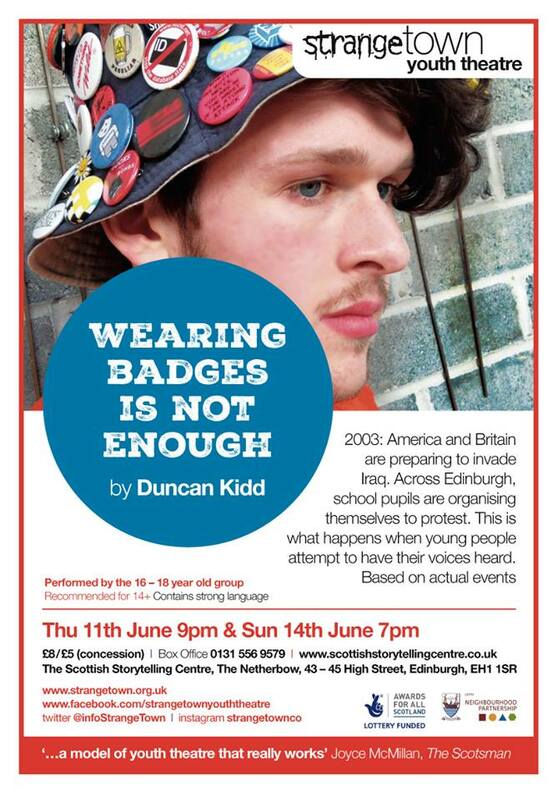 Strange Town Presents Wearing Badges Is Not Enough by Duncan Kidd. Based on actual events, this is the story of what happened when young people protested against the 2003 invasion of Iraq. Suitable for ages 14+. 9pm, Netherbow Theatre, Scottish Storytelling Centre, 43 High Street. Tickets cost £8/£5 and may be purchased in person, by calling the Box Office on 0131 556 9579 or online here (transaction fee applies to phone and online bookings). Also at 7pm on Sunday 14th June 2015. Strange Town is a theatre company that aims to enable young people aged 5-25 years to fulfil their creative potential whilst producing work of the highest quality that is daring, exciting and entertaining. The company is based at Out of the Blue, Dalmeny Street. The performers in Wearing Badges Is Not Enough are all aged 16-18 years. Free Range MTB: Bike Packing in Perspective. After attempts at losing toes during winter mountaineering and at breaking bones during downhill mountain biking, Swiss mountain biker Gian Liesch mixed disciplines and started bikepacking (cycle touring off-road). He now tackles 10,000 ft summits, riding across mountain chains in summer and winter and taking part in what is possibly Europe’s toughest MTB race…and has found that it is not ‘all about the bike’ but about spending time in and with nature. 2-3pm, Central Library, George IV Bridge. Free but booking is required via eventbrite here. This event forms part of Edinburgh Festival of Cycling 2015. 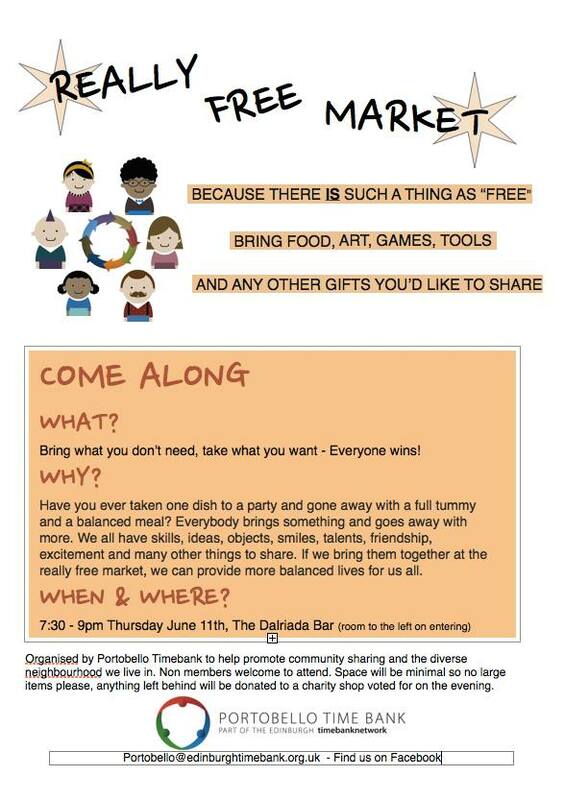 Really Free Market: come and share food, art, games, tools and anything else you like! 7.30-9pm, Dalriada, 77 Promenade, Portobello. Organised by Portobello Time Bank. Kircudbright Jazz Festival: your first chance to escape the city this weekend is to a picturesque artists’ and harbour town in Dumfries & Galloway. Kircudbright’s 18th annual celebration of traditional New Orleans, Dixieland and Swing Jazz – melodic music, mostly from the 20’s and 30’s – will include performances from Penman Jazzmen, Kircudbright International All Stars, Savannah Jazz Band, Sulwath Syncopators, New Phoenix Jazz Band, Diplomats of Jazz and many more. For more information (including accommodation options) and to book tickets please see the festival’s website here or its Facebookpage here. The festival continues until 14th June 2015. Eden Festival: if you want your weekend to be altogether louder and larger, you still need to head for South West Scotland, but this time to Moffat. This year’s Eden Festival will offer nine stages, kids’ arena, circus tent, drive-in cinema, comedy, cabaret, workshops, art, games – and of course music; acts include Ms Dynamite, Grandmaster Flash, The Skints, Portico, Dub Mafia, Dumfries & Galloway Choir, InChorus Choir and a gazillion more. For information and tickets see the festival’s website here: tickets are also available from many outlets in Edinburgh, including Ripping Records and Tickets Scotland. Accommodation options include not only ‘normal’ camping pitches but also luxury bell tents and wooden summerhouses. Raehills Meadow, Eden, near Moffat. The festival continues until 14th June 2015.